In Muzaffarnagar, Sanjeev Balyan is facing Ajit Singh, who has handed over his bastion - Baghpat - to his son, Jayant Choudhary. RLD Chief Ajit Singh is contesting from this parliamentary seat for the first time. The seven-phased national elections begin on Thursday and Muzaffarnagar in western Uttar Pradesh, which polls in the first phase, is set for a clash of heavyweights - Rashtriya Lok Dal Chief Ajit Singh and BJP leader Sanjeev Balyan, the sitting lawmaker here. Months before the general elections in 2014, Muzaffarnagar witnessed one of the most violent riots in its history. Sixty people were killed and about 50,000 were displaced in the September 2013 violence. In the Lok Sabha polls, held about six months later, BJP's Sanjeev Balyan defeated Bahujan Samajwadi Party's Kadir Rana by a margin of more than four lakh votes. This time, Mr Balyan is facing Ajit Singh, who has handed over his bastion - Baghpat - to his son, Jayant Choudhary, and is contesting from Muzaffarnagar for the first time. "Balyan's hate politics will not work this time," he told NDTV. "I have changed my seat because BJP rose to power due to hate politics and communal riots in 2013. I am going against that. For the last 15 months, I have been trying to boost brotherhood by speaking to people directly," he said. 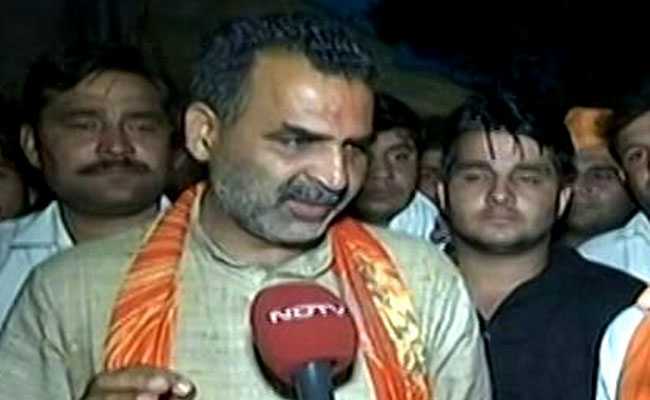 BJP's Sanjeev Balyan is the sitting MP in Muzaffarnagar. The parliamentary seat has a total of 16 lakh voters - 11 lakh are Hindus including Jats, Jatavs, OBCs and SCs; and about five lakh are Muslims. Speaking to NDTV, Sanjeev Balyan denied the allegations of "hate politics" and accused Ajit Singh of being an "outsider". "Ajit Singh is seeking votes based on religion and caste. I am seeking votes based on my work. He is an outsider. He has come to contest elections in my home. I haven't gone to his home," he said. "The people here know that he is here only for elections. He won't live here. He is a big leader. He will go and live in Delhi. I am a small leader and I will stay here only with the people. I go to every village, Ajit Singh doesn't. There is absolute communal peace here," Mr Balyan said. Modi wave was a key factor that helped Sanjeev Balyan win in 2014, but this time the anger of the farmers and a strong contender like Ajit Singh could make things difficult for him. Mushtaq Amin, a 60-year-old mechanic, claims it is Mr Balyan who tried to create tensions in the area; yet he will vote for BJP because of the "Modi factor". "We all live here (in Muzaffarngar) peacefully. Hindus and Muslims attend each other's weddings. PM Modi has done a lot of great work here. We will vote for PM Modi, and not for Sanjeev Balyan. He discriminates against communities and tries to create differences." A section of voters is also upset with the BJP government over its farming and business policies. Noor Hasan, a 55-year-old farmer, says he will vote for the RLD because of "unfulfilled poll promises". "The promises made by Modi government have not been fulfilled. Only some farmers got the benefit of PM Kisan Yojana but others didn't even get a penny. I have filled the form also, did all the formalities; but didn't get the money." The PM Kisan Samman Nidhi Yojana promises a minimum income support of Rs 6,000 to farmers with land upto 2 hectare but Noor Hassan says the farmers have not been able to avail benefits. Veer Singh, a 33-year-old trader, recalls the problems he faced after notes ban in 2016. "Notes ban in 2016 by the Modi government and then the Goods and Services Tax made things difficult for the traders. We all will vote for the (SP-BSP-RLD) grand alliance. All the votes here will go to them," he says. The RLD is fighting in UP in alliance with Akhilesh Yadav-led Samajwadi Party and Mayawati's Bahujan Samajwadi Party. Of the 80 seats in UP, SP is contesting on 37 seats, BSP on 38 seats, and the RLD will contest on three seats. UP will see polling in seven phases in the Lok Sabha elections.